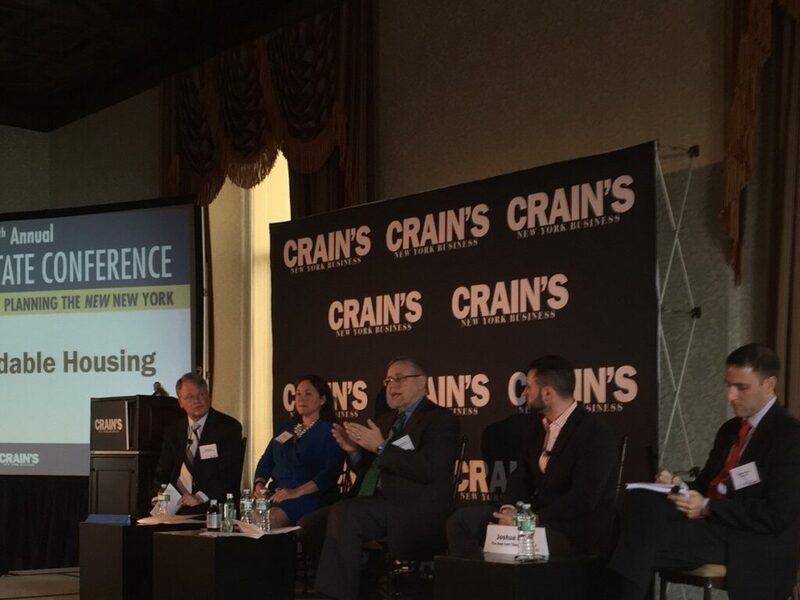 Capalino+Company joined Crain’s and New York real estate’s most impressive players at Crain’s Fourth Annual real estate conference on March 17, 2015 to explore the next stage in the city’s development. 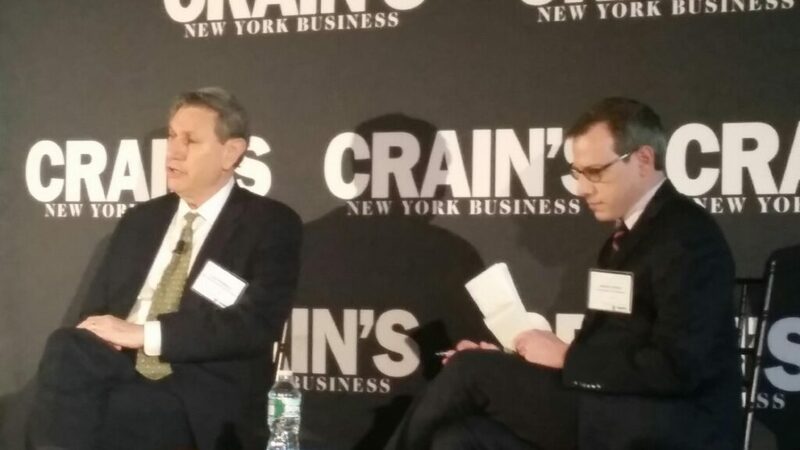 Chairman of the NYC Planning Commission Carl Weisbrod, the featured speaker, showcased the de Blasio administration’s latest zoning policies and urban-planning initiatives. The conference also heard from a panel of restaurant owners to discuss industry issues, including increases to the minimum wage and implications of rising rents on their operations. A second panel moderated by Greg David,Director of Business Reporting at CUNY School of Journalism, focused on affordable housing. Also in attendance was REBNY president Steven Spinola. “At Caplino+Company, we appreciated the remarks by Chairman Weisbrod on the city’s overall economic growth and his commitment to developing new market rate and affordable housing. We are working closely with our clients to facilitate the development of new market rate, affordable, senior and veterans housing, focusing on what type of development makes the most sense for our clients, often on a per project basis,” said Claire Haaga Altman, Director of Affordable and Supportive Housing Development Services at Capalino + Company. Chairman Weisbrod remarks touched on several major areas, including the strength of the NYC economy with more than 100,000 new jobs added in 2014. He noted more than half of these new jobs pay middle income wages, and he remarked on the significant tech sector job growth, as well as employment increases in all five boroughs. His central focus was the Mayor’s 10-year, five-borough housing plan to produce or preserve 200,000 units of affordable housing over this period. He explained that the plan responds to the City’s crisis of affordability, and the substantial resources and commitments that have been targeted by the City to produce this unprecedented level of affordable housing production, including the doubling to $8 billion in capital funds to support these efforts. He discussed the extensive efforts underway at City Planning, including zoning text amendments to promote affordability, area-specific rezoning studies to provide for new affordable and mixed-income housing, and mandatory inclusionary housing to ensure affordable housing in projects and areas undergoing zoning changes. “There have long been tensions between preserving industrial land and allowing for changes in the right locations to facilitate new investment and affordable housing development. These are tough calls, but I have no doubt that City Planning under Carl Weisbrod’s leadership will find the right balance that meets multiple objectives and ensures success,” said Richard Barth, Senior Advisor for Land Use and Housing Strategies at Capalino+Company. In discussing mandatory inclusionary housing, Weisbrod emphasized the importance of recognizing different markets and economics in different areas, and that ultimately there will not be a “one-size fits all” solution. He also discussed the upcoming East New York rezoning, and in response to questions about potential impact on industrial jobs, noted that the rezoning would not endanger any jobs in Industrial Business Zones, and that the rezoning would produce far more jobs, affordable housing, and services for the community than exist today. A common theme during his remarks was the administration’s focus on infrastructure investments, whether they be for economic development or in conjunction with planning for new housing and neighborhoods. He highlighted the City’s $150 million investment in Hunts Point, and noted the importance of the Vanderbilt Corridor rezoning in Midtown which will facilitate a major office project on 42nd Street resulting in more than $200 million in subway station improvements and annual tax revenues of $150 million. He also said he looked forward to the community task force recommendations for the larger midtown area which are being led by Councilmember Garodnick and Borough President Brewer.